An En-Tout-Cas court is an investment in the quality of the materials we use and the skills and experience that we have developed over decades as tennis court builders. No matter what the type of surface you need from all round family use to championship level tennis we have the surface to match your needs. 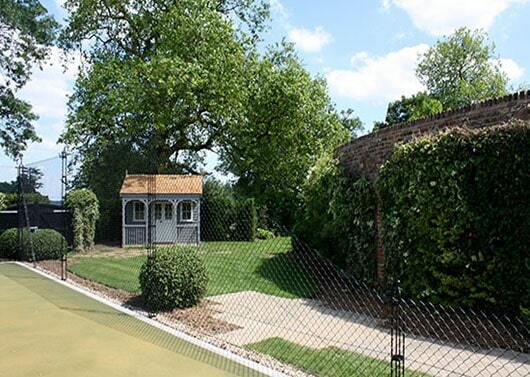 Our tennis courts are beautiful and designed to blend in with their surroundings. But it's the quality of the surfaces we use and the quality of construction, below the lush green playing surface and crisp white lines, that ensure that your En-Tout-Cas tennis court will give you years and years of fun and enjoyment. The story of En-Tout-Cas is one of ingenuity, and commitment to quality. En-Tout-Cas grew, over more than 100 years, from its origins in a Leicestershire brickyard through building runways in the Battle of Britain and surfaces for the 1948 Olympics to become the best-known artificial sports surface builder. All weather tennis courts is a much-used search engine term. This is probably the responsibility of En Tout Cas founder Claude Brown, in the days before the Trades Descriptions Act. It refers to porous tennis courts - courts that drain quickly after rain rather than courts that can be used in our climate, every day from January to December. The only all weather tennis courts we build are indoors. It is, of course, impossible to play in thick fog, inadvisable to play in the snow and dangerous on ice. For that reason, you will not find one of our surfaces referred to on this site as an 'all weather' tennis court. That's because we aim to give an honest appraisal of our surfaces' abilities, having found over the years that an accurate description of reasonable performance expectations leads to satisfied clients. If other companies offer similar surfaces to our surfaces and feel they need to describe them as all-weather, it should not be inferred that our tennis courts are all weather. En-Tout-Cas have been building the world’s finest and best-known tennis court surfaces since 1909. The name comes from the French phrase which translates roughly as "in all conditions." The En-Tout-Cas name is known the world over and is often used as a generic term for any synthetic tennis court. In fact, there is only one builder of En-Tout-Cas tennis court surfaces and our family involvement with the company stretches back to 1946. Quality comes first at En-Tout-Cas and always has. That’s why you will find our tennis courts and multi-use games areas in use all over Great Britain. Today we combine a proud heritage, an unashamedly old-fashioned pride in our workmanship and a commitment to innovation and modern technology. All tennis court surfaces require regular maintenance and cleaning to keep them in top condition. Moss, leaves and dirt can leave your court unplayable. Maintenance by EnTC Court Cleaning will keep the surface safe, and extend the court's life.